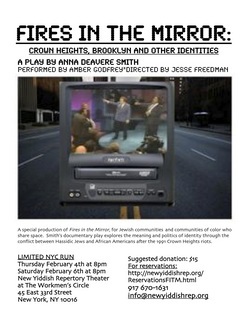 A special production of Fires in the Mirror, for Jewish communities who share space with people and communities of color. Anne Deavere Smith’s documentary play explores the nature, meaning and politics of identity through the conflict between Hassidic Jews and African Americans after the 1991 Crown Heights riots. Fires In the Mirror from Jesse Freedman on Vimeo.